Baked sweet potato wedges, steamed string beans, and sauteed onions with rosemary pork chops make for a colorful plate on a cold winter day. 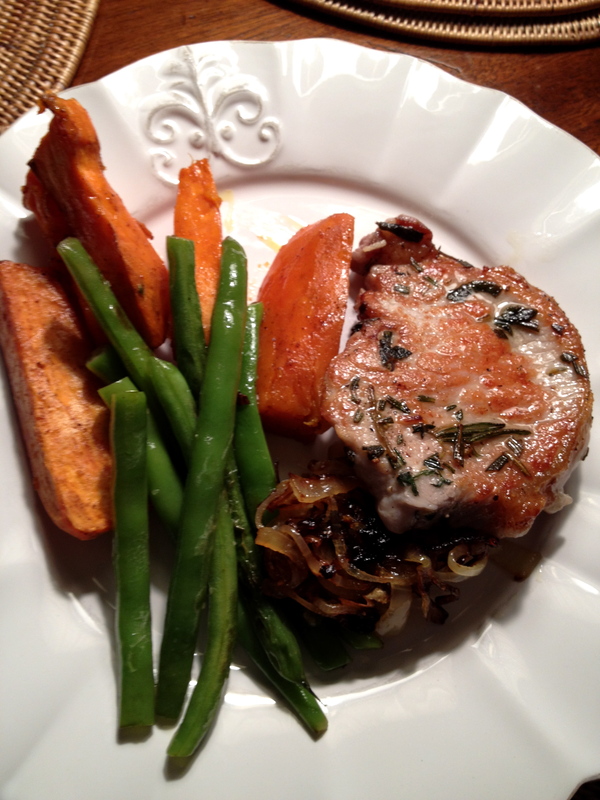 If you find yourself up to here with chicken breasts, try substituting pork chops. This cut of meat doesn’t have to be bland or tough: enhance the flavor by sauteeing your onions, removing them from the pan, and browning the chops in the same pan. This will allow the chops to pick up the leftover sweet flavors. Add fresh aromatic herbs like rosemary and thyme, then finish them in the oven for perfectly cooked chops.